If people own the Mysore palace, why can’t they photograph it? On a recent visit to the much-publicised and extremely touristic Mysore Palace, I found that many hundreds of people are actually coughing up a lot of money only to visit a relic of the Wodeyar (or Wadiyar) family. As we all know, the unfettered powers of anachronistic monarchies were pounded into bits and melted into the grand canons democratic laws and practice gradually since independence, and definitely with the abolition of privy purses by Indira Gandhi in 1971. Puffed up as they might imagine themselves to be, and their professed affiliations to democratic parties apart, these “rajahs” of yore and their descendants are obscure personalities today, largely devoid of special attainments in education and culture, and even less in democratic practice. I have no knowledge of the attainments of Srikanta Datta Narasimharaja Wadiyar Bahadur, who is the descendant of the Mysore family, although Wikipedia makes some claims about his accomplishments and political affiliation to the Congress party. He has also consorted with the BJP earlier and contested elections under that party’s banner. My interest here is less about the man and his lineage. I am focused on the monstrous British-designed palace that his family has built at the expense of the commoner. I visited this vulgar and loudly decorated palace recently and discovered that it has been turned into a earning machine, one that exploits people’s curiosity about the cruelly opulent lifestyle of another era. The entry fee is a stiff Rs. 20 per head. You are not allowed in with footwear, and to store that, you must pay a small amount. If you have a camera, you must not carry it into the Palace, although you would discover that only after you are near the ticket counter; the visitor then has to go back to the gate and place it in safe custody, for which again, one must pay a charge. The final rule is that you must switch off your mobile phone, although one cannot imagine why a few semi-literate, boorish staff must feel slighted by citizens taking the odd call or sending a text message. I did not know until after my visit that an enactment of legislature was made in Karnataka, titled The Mysore Palace (Acquisition and Transfer) Act, 1998, ( No. 32 of 1998 ) which received the assent of the President of India and came into force on 30.11.1998. After coming to know that I am among the owners of this Palace, as a citizen of India, I am outraged that the average citizen is subjected to virtual harrassment by those in charge of the administration. 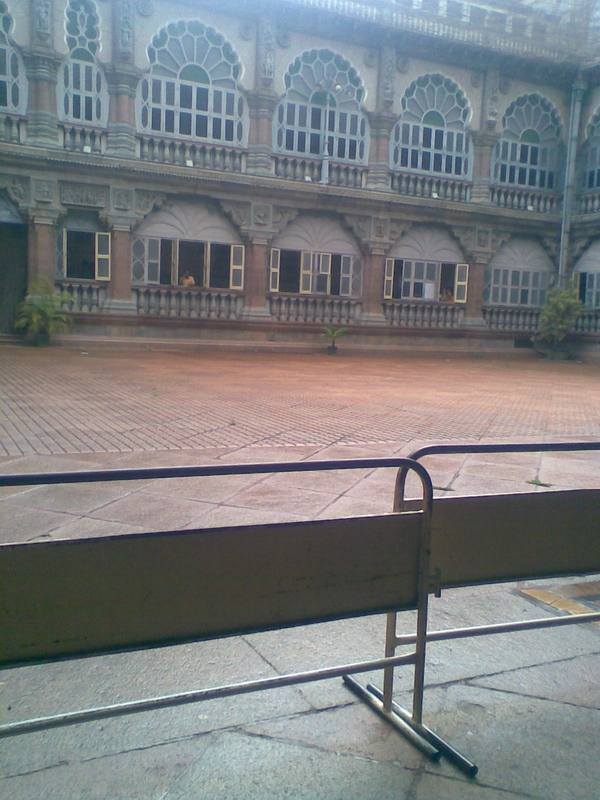 For one, the public are prevented from taking photographs inside the palace, of mere architecture. It is incomprehensible that a palace acquired as a monument by the Government cannot be photographed – if there are treasures that need to be safeguarded, these could be kept separately and that area earmarked. But why should not the stained glass and the symbols of royal hedonism inside the palace be photographed? In the event, I could make a couple of photographs of the interiors, using a Nokia 3500c mobile phone. This was noticed by a khaki-clad person, and he questioned me about it. I told him that this was an insignificant issue, and if he wished, I could remove the images. As you can see, I did not remove the images, because I believe that this sort of senseless rule has no place in a civilised society. Museums around the world allow you to take photographs. I have pictures of the displays at the Louvre, at the British Museum and the Rodin Museum in Philadelphia. What makes the Mysore Palace any more special or particularly vulnerable because of a photograph? Actually, I found the answer when I was exiting the Palace central area. Those running the Palace now, either the staff of the Government or the Wodiyar family, have put their own photographs of the interiors up for sale! So a little protectionism in the form of a curb on photos helps with the business. 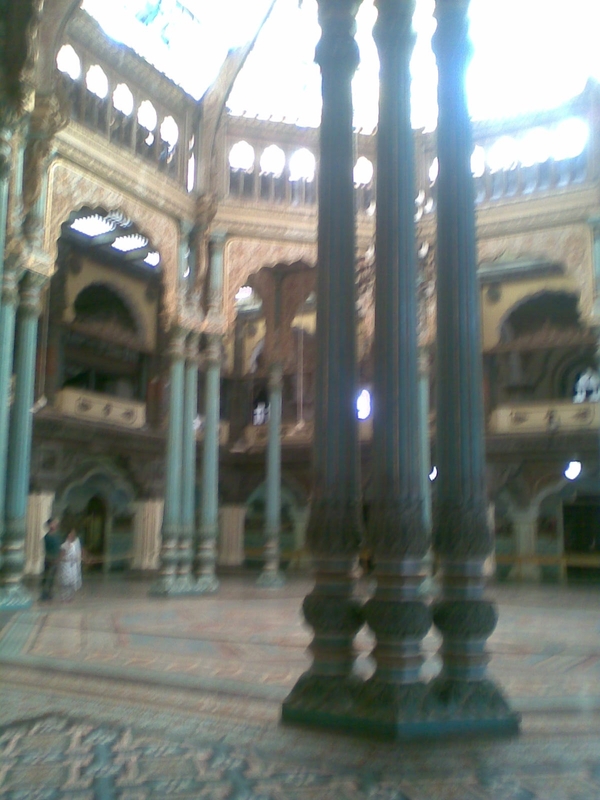 Security tried to prevent me photographing this interior view of Mysore's famous palace. Click to enlarge and circulate freely. To defy such protectionism, I am putting up the two pictures that I took here, both as thumbnails and as full sized images. Feel free to download and circulate them. They represent an assertion of your own ownership of this palace and a blow to crass protectionism, whether of the royal or the Governmental variety. The text of the Palace acquisition Act is here, taken from the Karnataka National Informatics Centre website. I do not find any clauses in it that prohibit photographing of any aspect of the Palace. If the restriction is being placed officially, it appears to be prima facie illegal. Good affront points made there. Sometimes rules ruin the already ruined palace of majesty and history there. I congratulate you on this. I have noticed this “no photos” thing being carried to extremes in various places in India, including malls, cinema theatres, shops, roads and yes even of buildings!! It’s outrageous because it goes beyond the boundaries of common sense. Why can’t one take a photo of one’s family in an outdoor mall I can’t understand!! Will this prevent a bomb blast?? although i still cannot understand the photography restriction in malls, i’m not against restricting it here. Its just that we Indians happen to be very annoying with the camera, taking numerous different poses and making sure everybody in the family gets their turn inside the frame. “vulgar and loudly decorated” !!!!! It is not that I like monarchy. When I saw this palace first thing that came to my mind was “why a king should build such a big house for him from the money people”. But please it is not vulgar and loudly. Mobile phones and cameras are not allowed for security reason. U may hate monarchy. That doesn’t mean that you have to describe such a beautiful palace as vulgar . I accept that u are one among the owners of this palace. Even I am and all the citizens of this country. If they allow to stay all of us in that palace just because we are owners that palace will be destroyed in just few days. Yes they don’t allow slippers. But that is to maintain the cleanliness. And they are not looting anyone there. Just 50 paise per pair is the least you can give to a person who will look after your slipper. Why have you put just 2 photos. Put whole map of palace and show to every terrorist and thief what route they have to follow. Don’t be so prudish. It is your western mind-set speaking here. If you go to Louvre and other european palaces or castles, you may probably think their taste as very sophisticated and aesthetic. Mahatma Gandhi called Nalwadi Krishnaraja Wodeyar as ‘Rajarshi’ (meaning saintly king) for nothing. Now, Gandhi did not approve of undue spending, but inspite of that why did he call Nalwadi as the saintly king? It is because Nalwadi built the palace not just as his residence but as a showcase of the art and architecture of the day. Nalwadi foresaw the future and wanted to turn Mysore into a tourist paradise. Today after about a century, his dreams are coming true. Mysore palace is 2nd only to Taj Mahal in tourist attraction. Please do not insult a great king by your narrow minded comments. If you cannot appreciate beauty, at least do not pass bad comments just because you had bad experience while visiting the place. It shows you in a bad light. I can’t see what Gandhi’s comments have to do with the aesthetics of the palace. You may be right about the touristic brilliance of the Palace in hindsight, but that does not make the lack of cultural etiquette among those running the tourism any less offensive; it is not at all businesslike, is plainly colonial, if not feudal. Also, there is no mention of the sophistication or aesthetics of the Louvre or other museums in my post, but to their general welcoming and professional attitude to visitors, including photography (they also sell pictures, videos and memorabilia, but don’t try crude prohibition as in the Mysore Palace). Incidentally, a professional museum culture demands that students and seniors be given concessions to visit. Is that the case with the Palace, more so since it has been acquired by the people of India? Things still haven’t changed after 7 years of your post. Photography is still banned, security threatens with a fine or confiscation of your phone, if caught in the act of taking a photo. Fabulous post. I don’t understand why allow people in and let them see from their eyes ( after paying) and restrict them to see from their lens. Indian tourism needs to go a long long way. Half the time things are poorly maintained, dilapidated. Other times good things are restricted to be showcased. Why on earth? What are they hiding? Is it a national security zone? It just doesn’t make sense. They need to wake up and take lessons from tourism abroad where even a Roman sink is valued and made touristy! India is beautiful but Indian tourism needs to go a long way. Kudos for writing what you felt.